The Virgin Gorda Sugar Boys will face their nemesis Islanders yet again on Sunday in a quest for a Wendol Williams Cup 3-peat, in the second BVI Football Association tournament of the year, after a heart breaking penalty kicks loss to the Islanders in last month’s Terry Evans Memorial Knockout Cup final. The tournament, named in honor of the former BVI Football Association Executive Committee member who died of a heart attack six years ago en route to the 2010 FIFA World Cup in South Africa, will see Sugar Boys and Islanders facing off at 7 p.m. The Sugar Boys were held scoreless for the first 62 minutes, as Wolues goal keeper Andre Gaymes was responsible for keeping the game goalless with a string of fine saves. However, as the game wore on, the Wolues fitness came into play. 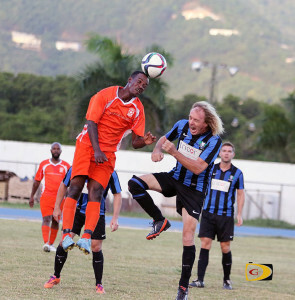 Sugar Boys captain Derol Redhead timed his soaring leap to connect on a header for their 1-0 advantage. The lead was short lived however, as Allesandro Pallandino outpaced two Sugar Boy defenders and fired home the equalizer in the 81stminute. As the game approached it climax, the Sugar Boys capitalized on the fatiguing Wolues with two quick goals, the first from Roger Roberts in the 88th minute and then Akeem Hendrickson in the 88th to seemingly put the game to bed. The Wolues though made one last valiant effort, but the ball hit a post, then they missed out on a scramble in front the goal, before Andres Bailey scored to make the final 4-2. Already with the Terry Evans Memorial Knockout Cup after a hard fought victory over the Virgin Gorda Sugar Boys on penalty kicks, the Islanders are seeking to add the Wendol Williams Cup and deny the Wolues a 3-peat. The Islanders advanced to the final after beating the Panthers 1-0 off a Francis Primo strike in the 13th minute of play. The Islanders were unable to capitalize on their many second half chances to pad the score, as many of their players’ shots were errant. The Panthers who were trying to break up the Sugar Boys and Islanders string of final appearances, will now have to wait for another opportunity to mount a challenge. Action will kick off at 5:00 p.m. on Sunday with the VG United Ladies and the Ballstarz followed at 7.00 p.m. by the Islanders against Sugar Boys.